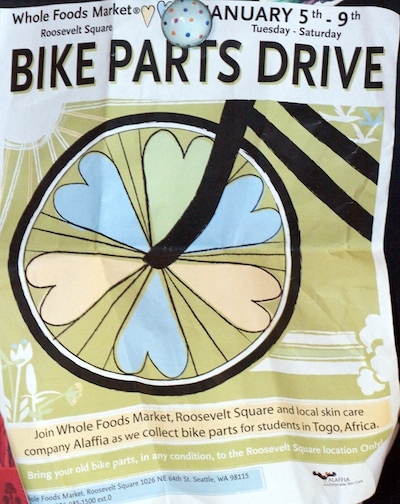 Spotted this flyer for a Bikes Part Drive at Wholefoods Roosevelt Square. Please bring in your new or gently used bike parts to donate! We’ll be collecting parts to help Alaffia with their Bicycles for Education program. Alaffia makes SHEA butter skincare products and empowers their vendors in Africa with a coop. They gather bikes to give to students so they can get to school. This drive is to supply parts for the cargo container of bikes they gathered in the past. Haven’t tried Alaffia, but we’ve got SHEA in our chamois. After years of using Assos we switched to Nubutte. The stuff is remarkable, even healing this road rash. Previous Previous post: What Bike is This?